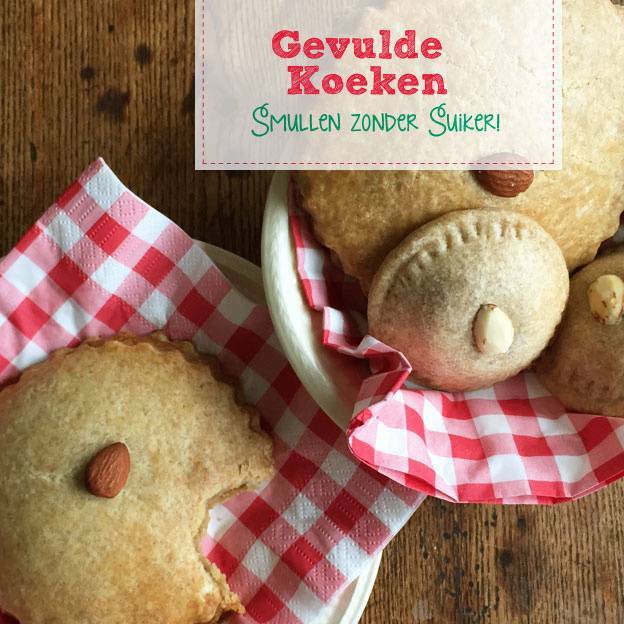 A delicious recipe from Karlijn to make stuffed cakes in which Greensweet is processed extra sweet. These filled cakes are really to be feasted! Hard on the outside and soft and deliciously sweet inside. Eat them when they're still a little warm, mmmm ... To sweeten the dough I used to; stevia sugar 'extra sweet' from Greensweet Stevia. Remove the baking sheet from the oven and cover it with greaseproof paper and preheat the oven to 170 degrees. Take a large bowl and put the flower, the greensweet extra sweet and mix it. Add the egg and the coconut oil and stir with a fork until a dough mass is formed. Make a ball and put it in the refrigerator for 20 minutes to stiffen. Mix the almonds with the honey with a fork into an easily kneadable one, make sure that it is not too wet but also not too granular and dry. Also put this in the refrigerator to stiffen. Place a sheet of parchment paper ready on the baking sheet. After 20 minutes of stiffening, remove the spelled flour from the refrigerator and place it on a baking paper sheet on the counter. Press a little flat and put a parchment sheet over it. Then roll the dough out until it is about 0.5 cm thick. Using the projection shape or with a glass, cut out the desired number and size of circles and place the circles on the baking sheet. (With 1 portion of dough you make 6 small (7 cm), 4 medium (9 cm) and 2 very large (12 cm) cakes.) Make another ball from the remaining dough and roll it flat again and repeat 'protrusion' so that you have as many rounds as there are on the baking sheet. You now depend on the large 4, 8 or 12 rounds, half of which is on the baking tray. Make balls of the almond paste as much as they are on the baking sheet and place them on the rounds. Press a little flat and put a round of dough and press the sides around. To get a nice decorated border, you can do this with a fork, for example. Brush the top of the cakes with some (almond) milk for a brown color and press an almond in the middle of the cakes to garnish. Bake the stuffed cakes for about 25 minutes at 170 degrees until they are golden brown in color. Take them out of the oven, allow them to cool down and then remove them from the baking paper and let them cool down on a rack.